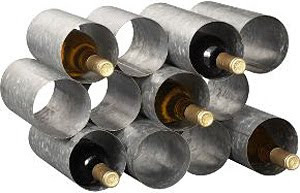 Hand-welded from galvanized sheet metal, this unpretentious rack holds up to 12 bottles of wine, and works in both horizontal and vertical positions. Add a little industrial style to your home with this $80 Galvinized Wine Rack, it's sure to turn heads and makes a great gift. Available HERE.